And this island aged 65 000 000 years? 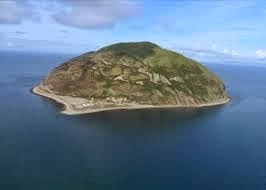 The island is Ailsa Craig, from the Gaelic for the fairy island. It lies 10 miles from the mainland in the outer part of the Firth of Clyde and sits like a wee tumshie bunnet on the horizon. Or a cupcake. Or a tea cosy. 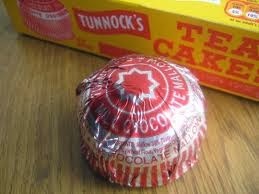 Or a Tunnock's Tea Cake. Or a fresh from the oven blueberry cake. The lovely photos here are from the Maybole.org web site. It is an island with moods. ‘The Craig’ sneaks into the background (photobombs?) on millions of photographs of Scottish holiday makers as they get hypothermia spending the summer holidays down the west coast. 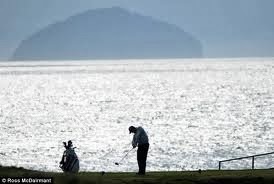 Most of the Turnberry Golf Course has a great view of it, the best from the 2nd green I am informed by gentlemen in strange trousers (golfers). Any room in the hotel with an island view costs a fortune. It’s the sort of island that makes you smile, covered in sea mist, poking out the sunshine, glistening in the water. It's a happy wee place. It’s other name is Paddy’s milestone, being half way as the crow flies between Glasgow and Belfast and that was a traditional voyage for Irish immigrants seeking work in Glasgow. Or maybe it's called that because it was a haven for Catholics during the Scottish Reformation in the 16th century. In 1597 a kind gentlemen called Hugh Barclay used the island to provide food and shelter for a Spanish invasion which might have helped re-instate the Catholic faith in Scotland. It didn’t work and Hugh drowned trying to escape the Protestant Rev Andrew Knox. In between times the island got a bit swashbuckley with pirates and parrots and peg legs ready to sail out and steal the booty of boats going up and down the Clyde. 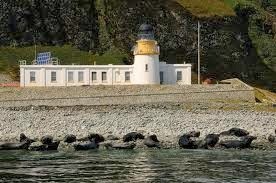 Later the island was used as a prison and then the famous lighthouse was built by the famous Thomas Stevenson. I think he had a famous son. Robert Louis …. I am lucky enough to have been on the island. Sea bird city. It’s heaven for birds, not so good for human beings. It has a small bay, one windy path up to the top, no where to sit down at the top to admire the view ( or hold on as it is so windy). There is a small bay with a few buildings (ruined), two huge foghorns and a strange wee railway track that goes from nowhere to nowhere. Intriguing. The best way to see the place is to take the boat round it; 40000 breeding pairs of gannets, puffins, kittiwakes, black guillemots, razorbills, herring gulls, peregrines and a special line in cheeky seals who twiddle their moustaches while bobbing around on the waves. It is two miles in circumference, about 1100 feet high. The 200 acres is a plug from an extinct volcano left sticking up after the softer rock of the volcano itself was worn away. The island has a fresh water spring but no other mod cons. The owner, the 8th Marquis of Ailsa put it up for sale in May 2011 for £2,500,000 but dropped that price by a million two years later. I believe, and hope, it has been bought by a wildlife trust. The RSPB has a lease on it that runs out in 2050. The fact that the island went up for sale refuelled the land reform debate. 50% of Scotland is owned by less than 500 individuals ( from illegal gain during the reformation) and has been passed down through the family ever since. I recall having a chat with a chap at a posh publishing dinner in London. He told me proudly that his family owned a large chunk of the west coast. He then added, even more proudly that he had never visited Scotland (weather was too bad), never mind the bit his family owned. You can insert here any mode of death I might have thought appropriate. Indeed the Craig itself has only changed hands once in 600 years but at least the Marquis used to pop over for the odd BBQ. The puffins were nearly driven off the island by the introduction of rats ( they eat the eggs of ground nesting birds) but widespread use of warfarin has dealt with the rat problem so the puffins are back in droves. There used to be an annual gannet hunt – gannet being considered a delicacy in those days and the uncle of one Robert Burns was involved in the hunting and trading of gannet. Hardly surprising as all this takes place in the Ayrshire coast, Burns country and all that. So what has all this got to do with the two sporty types above. 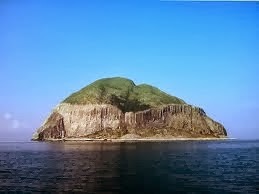 Well 70% of the curling stones on the face of the planet come from Ailsa Craig. The granite of the island has ‘an unusual crystalline composition’ which gives a uniform hardness. From the 1850’s the island has been quarried for its riebeckite. Most other stones come from the Trefor Granite Quarry in Wales. 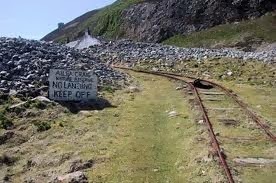 Blasting is not allowed on the Craig any more but loose rocks are still used by the Kays of Scotland company. They had their first wee harvest of loose stones in 11 years in 2013 and got 2000 tonnes. That is enough to fulfil all orders until 2020… after all, they don’t wear out and you can’t break them. 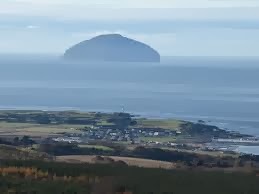 The Blue Hone stone from the island has very low water absorption so ice does not erode the stone, and the other type of stone produced is called Ailsa Craig Common Green, which is of slightly lesser quality. The stones from this island won the gold medal for Rona Martin and her team in 2002, and helped Eve and Dave and the curling squad to their medals in Sochi. 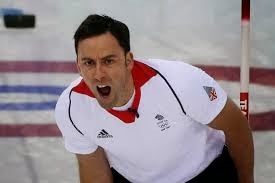 There is one curling rink in England, one in Wales and three within twenty minutes of my house. 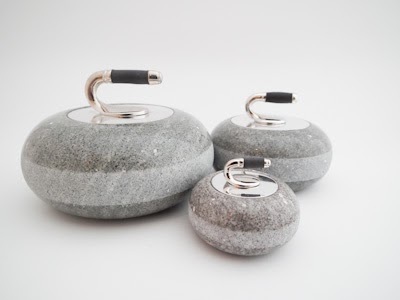 So the link is curling stones! Nowadays there is a lot of emphasis on where things originate. Some aspects of that are good, and others less so. For example, take wine. The origin is so important to the consumer that the makers even protect the regional name. 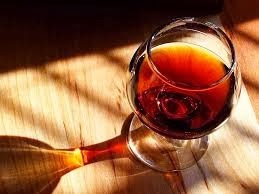 Thus port must come from the Douro region of Portugal through the famous port houses of Oporto. (Most of them are English owned, incidentally.) This is such a big issue that bilateral trade agreements protect it. South Africa had to change the name of home-grown ports – made in the traditional fashion from the same cultivars - to Cape Vintage. Similarly local sparkling wine became Cape Classique instead of champagne. The only market where this sort of thing isn’t an issue is the US. No one messes with the US market! 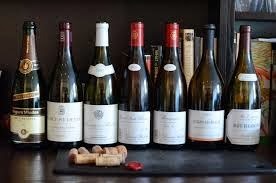 So concoctions known as White Burgundy and Red Burgundy continue to sell in US supermarkets although they have nothing to do with the glorious chardonnays and pinot noirs of Burgundy. Does it matter? I doubt it. The consumers of these wines are under no apprehension that they come from France and they couldn’t care less in any case. On the other hand, it does seem reasonable that a statement like “Made in France” should be protected. If this appears on a wine, and the wine comes from Algeria, for example, surely the consumer is being misled by false advertising? Well, yes and no. A significant amount of “French” wine comes from somewhere else. The question is definition. Does made in France mean grown in France, vinified in France, bottled in France, or all three? The answer is no. Some guidelines must be met for “made in France” to appear on the label, but it doesn’t mean you are buying 100% French grapes made by a French winemaker bottled in France. So does “organic” really mean better and healthier? The answer – according to a survey a few years ago – was yes and no. The food was fresher, more attractive, and tasted better. In terms of nutrition and health, there didn’t seem to be much in it. But that’s not the point. The consumer has an expectation and a right to expect it to be met. In the case of wine, my (very limited) experience is that it is better. And more expensive. The winery is going the extra mile and that must, on average, translate into quality as well as extra cost. Diamonds are another good example. 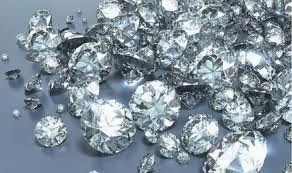 Diamonds have been brilliantly marketed as a rare and beautiful commodity, synonymous with love and lasting commitment. (“Diamonds are Forever.”) The success of the industry has much more to do with the presentation to the consumer than the difficulty of wresting precious gems from the bowels of the earth. So when the issue of “blood diamonds” (or as the industry prefers “conflict diamonds”) became a real concern to diamond lovers, the industry realized that they were facing a real threat. 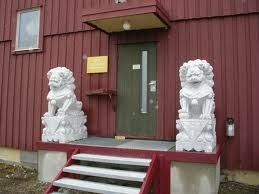 How could these symbols of love be used to fuel wars, slavery and repression? The result was the Kimberley Process. The ultimate answer to 'where are you from?' Each packet of gems sold now carries a pedigree that indicates its origin and route to sale. Only countries that subscribe to the Kimberley Process are able to certify the gems and assure consumers that the diamonds have been mined legitimately under fair working conditions and have made their way to market without the addition of any black market stones. It is a well-planned and well-managed process, and pretty well does achieve what it claims. But like all man-made things it has its flaws. Zimbabwe has been a signatory since its inception. So take those origin labels on the things you buy with a pinch of salt. And don’t be too surprised if you find some iodine mixed in with the sodium chloride. Stan Trollip has taken us on a marvelous tour of the big five animals of the African wilderness. We have a Big Five in the United States, too. The term here refers to trade book publishers. I put a lot of effort into trying to write a better lead sentence for this blog, but it was impossible to do so without a play on words like “beastly,” “wild,” “dangerous,” “jungle,” “extinction,” and “soul-chilling,” all of which Stan used in describing actual animals. See what I mean? 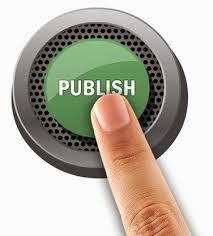 When people ask me, “Who is your publisher?” I answer in different ways, depending on who is asking, and yet all the answers I give are the absolute truth. My mystery novels are published by Thomas Dunne Books, a subsidiary of St. Martin’s Press, but the spines all carry the logo of the Minotaur imprint. 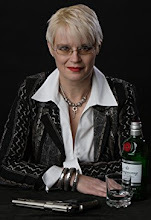 My author page is found on the Macmillan website. This is a result mergers and acquisitions. A Germany company—Verlagsgruppe Georg von Holtzbrinck owns Macmillan. It has other subsidiaries in the US, namely Farrar, Straus and Giroux, Henry Holt and Company, Picador, and Tor/Forge . To say nothing of their other media and entertainment efforts. Part of Rupert Murdoch’s empire, the American Harper publishing house was founded in New York 1817. 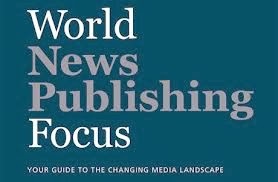 NewsCorp (Murdoch) bought its descendant Harper and Row in 1987, and then expanded its name to HarperCollins when they acquired The British Publisher William Collins and sons. Nowadays, in the States, they also encompass William Morrow, Avon books, and a bunch of other less famous imprints. This critter is a recent amalgam of what used to be five and six of the big six. Another German media company owns it (them?). The newly wed company already has 250 “children”—imprints that span all of the categories of book publishing. This company began in 1924 as a publisher of a wildly popular crossword puzzle book. It is now owned by CBS and comprises several imprints, most famously Scribner, Pocket Books, and Touchstone. The conglomeration of what used to be scores of companies into these five has had a great impact on the publishing business in general and on writers in particular. Contentious relationships between publishers and authors most likely started with the Gutenberg brothers. I have heard many friends complain bitterly about the lack of respect authors get from their publishers. They love their editors, but not the huge corporations they work for. Having spent a lot of my professional life working with large corporations and having run a small business, I am well aware of the realities that motivate business decisions—including mergers and acquisitions. 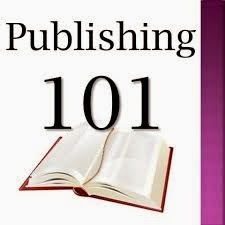 I have always said that the worst thing my publisher could do to be would be to go out of business. I can recite the lines on their budget. There is no point in my loving my editor if the company she works for can’t pay her a decent wage, pay for benefits, her computer, the electric bill. It is also easy to see how the tsunami of recent change has made the futures of even these giants hard to predict, much less ensure. Some are clinging to old wisdoms. 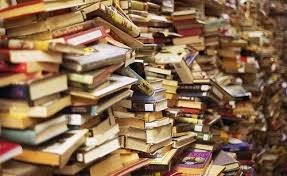 Some are grasping at each new social media straw as the best way to sell books in an environment of biblical clutter and deafening roar. We want them to make our books successful. But does anyone really know how to make that happen these days? Consolidation costs writers. 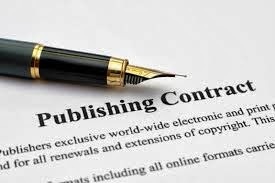 Not just because there are fewer places to take a manuscript, but also because companies that used to compete for books are now folded into a one family and are not about to compete with people under the same corporate roof. Homogenization of product is another outcome. You can hear the top executives. “Another beast just made a bundle publishing Fifty Shades of Grey. We need to jump on that bandwagon. Find me the next book like that.” And so forth. Medium-sized companies that used to take a chance on a quirky book by an unknown author are now answerable to the top brass in another country and afraid of getting a pink slip the next time the corporate stock dips and costs need to be cut. Cookie cutter mentalities are not likely to foster imaginative risk taking. Without risk there is no art. Mostly, I see being in this field right now as a sort of white-water rafting. Someday, we may reach a point where the river becomes calmer and easier to navigate. In the meanwhile, hang on tight to your paddle, keep your eyes open for rocks under the surface, and try not to scream. 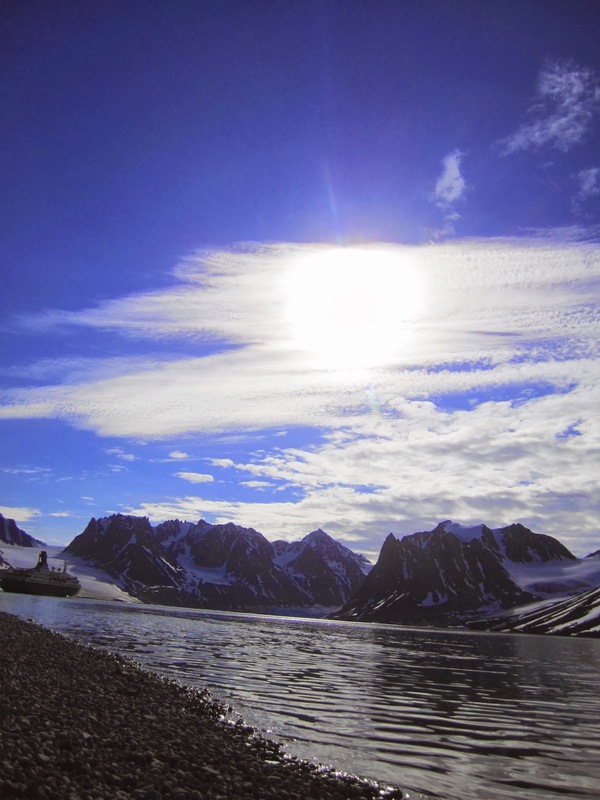 Guest Blogger: Peter Guttridge--"Fiction in a Cold Climate." A few weeks back we ran a post offering a guest slot every other Sunday to mystery writers who base their stories in non-US settings. We think it a great way of introducing our readership to new experiences and places. The response was overwhelming and we’re delighted to kick off the very first in our series of Guest Author Postings with this piece by the award winning, much admired, and humorous English novelist and critic, Peter Guttridge. Peter wrote six comic crime novels (winning a Lefty for one of them), featuring the deadly duo of Nick Madrid and Bridget Frost, before he turned to the Dark Side with his gritty Brighton Trilogy­—although his definition of trilogy now encompasses five novels. As crime fiction critic for the UK’s Observer newspaper for eleven years, Peter has read far more crime fiction than is healthy for anyone. 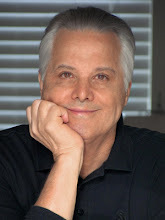 But, a glutton for punishment (or by now hopelessly sick in the head), he is in his second year as judge for the CWA John Creasey Dagger for Best Debut Novel. Welcome, Peter. And thank you. I’ve been a traveller all my adult life, lucky enough to visit a number of exotic locations. I travel more often than I write novels so ideas for novels set in any one of those locations are backing up in my notebooks. My pathetic excuse is that I need to come up with titles of my novels before I can write them. My trip to Cambodia and Vietnam four years ago only paid fictional dividends when I found a title, Those Who Feel Nothing, last year. My eleventh novel, it comes out in the summer. I think the Arctic might be next, after a trip some months ago, even though these darn Scandinavians chiller writers have got there before me. 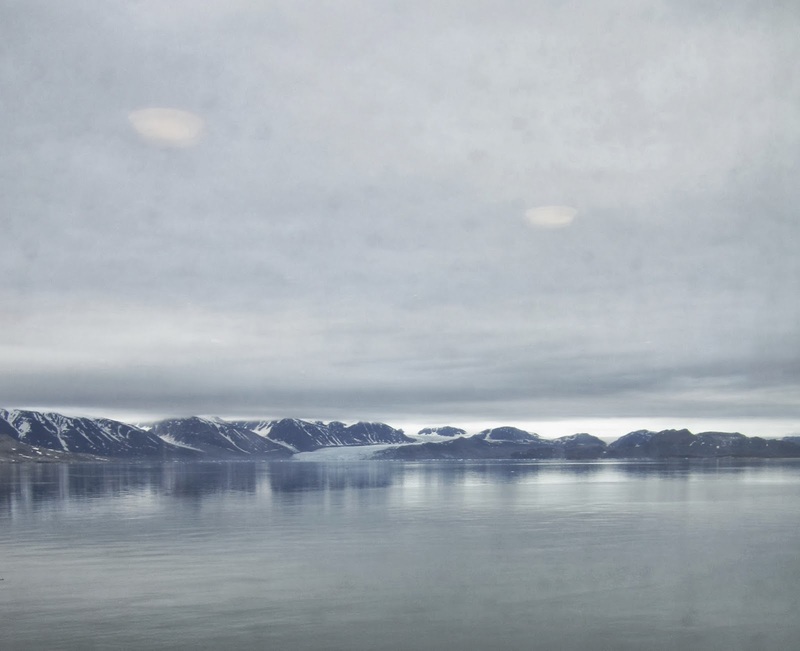 I only saw a tiny bit of the Norwegian Arctic – the Svalbard Archipelago, halfway between mainland Norway and the North Pole – but it was enough to set my imagination roaming. The only town of any size on the archipelago - Longyearbyen (population 2,000) on Spitzbergen island - has a fantastic backdrop of two glacier tongues and all around town there are the evocative remains of abandoned coal-mining operations from the early years of the 20th century. Plus you’re advised not to go much beyond the town boundaries because this is polar bear country. Coal mines; a closed, cut-off community surrounded by dangerous animals. Yes, yes. But when the fog cleared the grey sea and sky took on a rare, if chilly beauty. 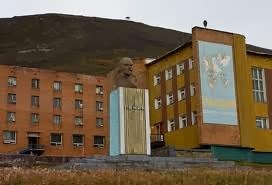 Here the danger from polar bears is more severe so men armed with rifles guard every path into town. 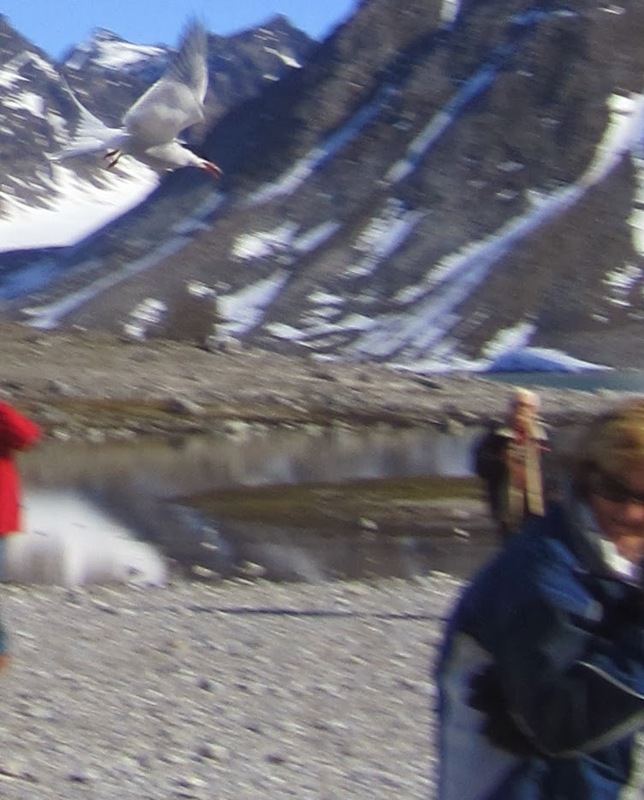 Shame nobody warned me about the Arctic tern. The cute little bird nests on the ground beside the paths – and, as I discovered to my cost, attacks if you get too near. A long sharp beak and a bald bonce don’t make a happy pairing and there’s little dignity in a 6’4” man slithering down an icy path, waving his arms in the air, chased by an angry bird wheeling round his head taking lumps out of him. Hurts too. An Arctic tern displayed similar behaviour in the next place on Spitzbergen I visited – Magdalene Bay – but I was wise to them by then. 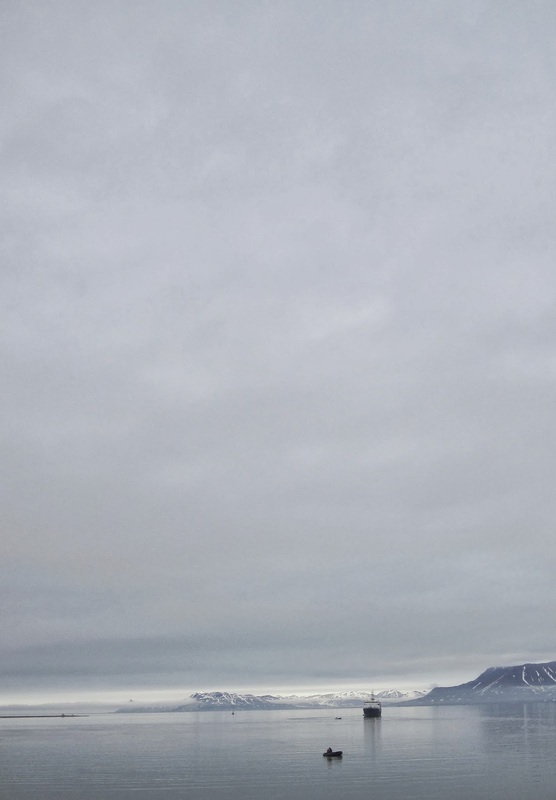 This bay is actually a fjord and sailing round the island to it the spy thriller juices still flowed as we passed Barentsburg, a gloomy looking Russian settlement occupied by some 500 Russian and Ukrainian coalminers. But when we dropped anchor in the spectacularly beautiful fjord eco-disaster/man against nature ideas started jostling in my head. Used by whalers since the start of the seventeenth century, Magdalene fjord is now uninhabited. Because it is an area of great scientific interest and the ecology is fragile no more than twenty or so people are allowed on its narrow shore at a time. Which doesn’t mean the ship’s crew can’t temporarily install a few home comforts. Looks almost obscene in this pristine environment but it was fun at the time. 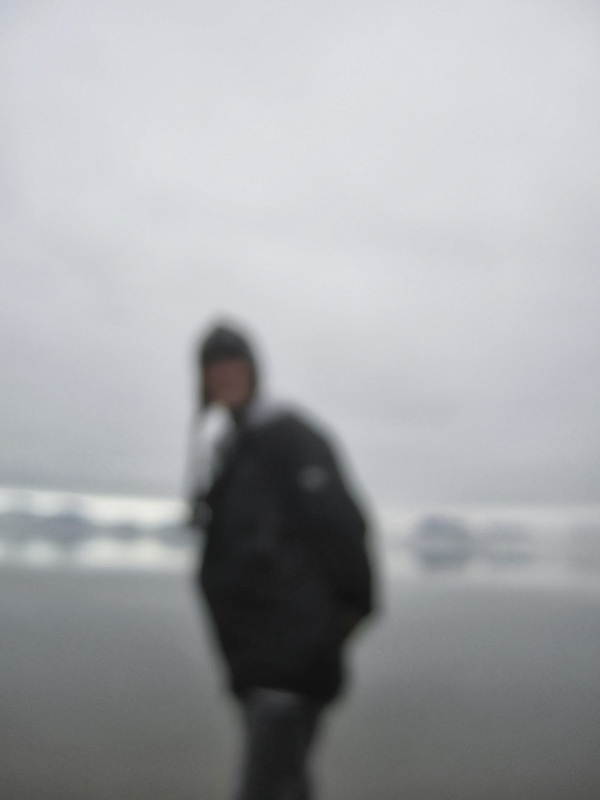 On shore, our men with rifles had found fresh polar bear prints near the beach. 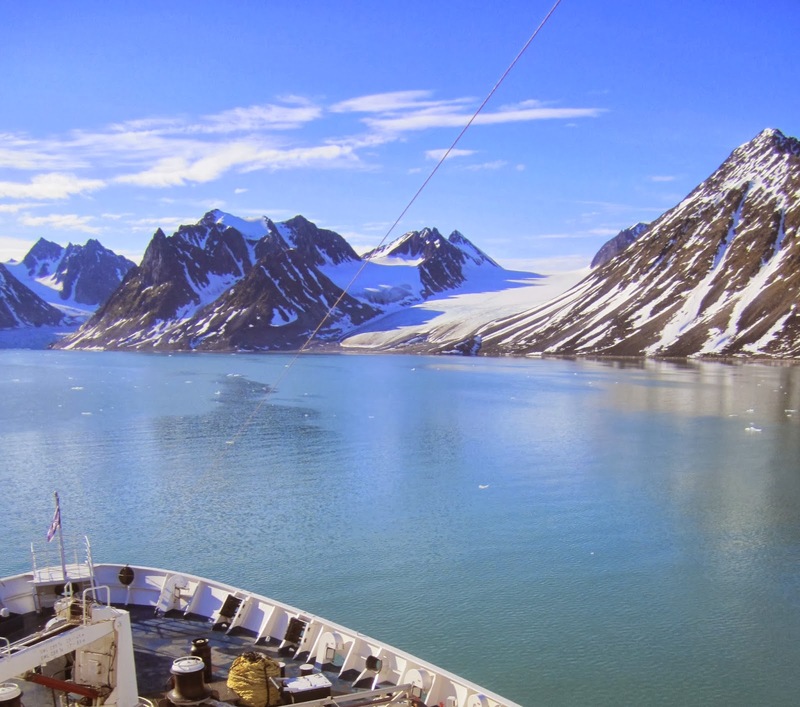 At lunchtime I was making notes on the sun deck of the ship whilst waiting for my barbecued chicken to cook - one of the surreal things about being way inside the Arctic Circle was how warm it often was – when someone with binoculars shouted they could see a polar bear. There's a polar bear coming down that glacier. We all rushed to the side of the ship and focused our own binoculars. Yup, there he was making his way down to – oh, this was interesting. He was heading for our latest party of twenty on the shore, presumably regarding our fellow seafarers as a buffet lunch put on specially for him as a change from eating fish every day. The party was oblivious to him. As were the two riflemen, who were facing in the opposite direction. Cue pantomime shouts of ‘He’s behind you!’ Eventually, our captain radioed through to the tender on the shore. Then there was panic as the people on the shore could see the bear now – and that it was moving pretty quickly towards them. Mere mortals may not approve of what I’m about to say but fellow-writers will, I’m sure, understand. Sadly, everyone got safely away. So watch out because my eco-disaster spy thriller featuring a whodunnit in a mining village a century ago and a contemporary murder mystery among a scientific community overrun by blood-crazed polar bears (and terns) – with, what the heck, a plague and a sinking cruise ship thrown in – is going to be a doozie. I’ve even got a suitably mysterious possible cover image. Frankly, all I need now is a title. 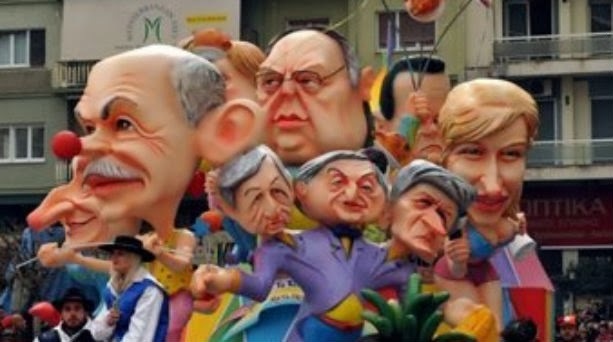 It's Carnival Time in Greece. I think it’s time to write about what I see as the essence of what it means to be a modern-day Greek living in Greece. I’m talking about what makes the Greek soul tick. To me, whether you’re Greek or not, tiny momentary pleasures are what buoy up sagging spirits, bond us to our roots, remind us of our heritage, and reinforce our choice of worship. Finding satisfaction in the simple acts of living is an essential ingredient of the Greek way of life. Perhaps that’s what draws me to them so strongly. Even in winter there is joy to be found in everyday Greek life: coffee with friends in a cafenion, a stroll by the sea, a gaze up toward the mountains. And every so often the entire country joins together in celebration of the glory of life that is Greek. Today’s blog falls in the middle of just such a time. This past Thursday was Tsiknopempti, eleven days before the beginning of Greek Orthodox Lent. 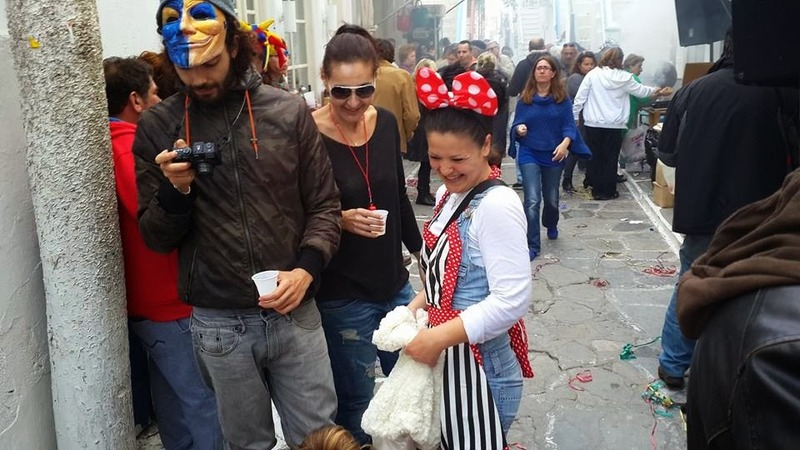 “Pempti” means Thursday, and though tsikno is somewhat hard to translate, most settle on “burnt” and translate Tskinopempti as “Burnt Thursday.” It signals the beginning of a carnival atmosphere in many parts of Greece. 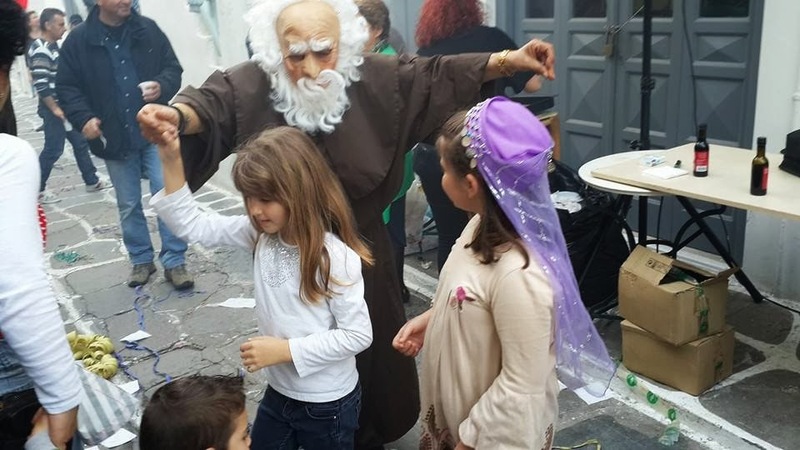 Actually, carnival season in Greece commences weeks before the start of Lent with the opening of a sacred text (Triodion), but that occurs in a sedate church service. 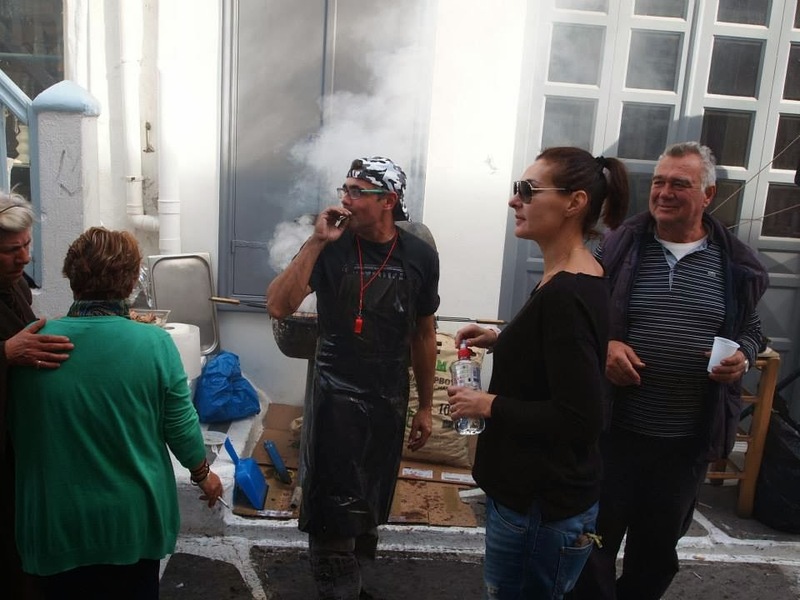 True Greek-style partying doesn’t actually kickoff in most places until Burnt Thursday, a day of engulfing smoke and scents from endless grills sizzling with meats, for it kicks off the last “legal” weekend for red meat eaters to indulge in their carnivore passions. Which brings to mind something many of you may not know. 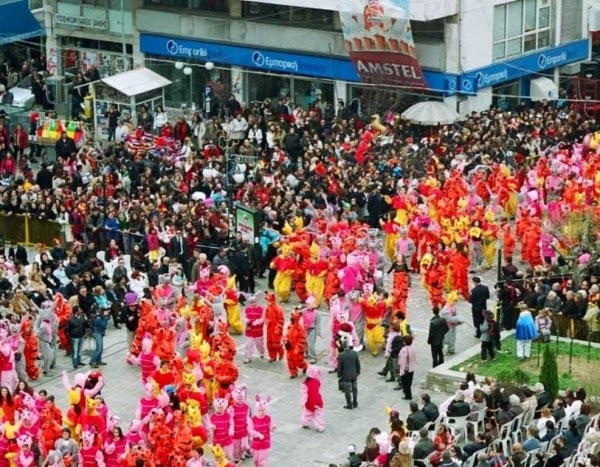 Carnival comes from the Latin carne (meat) and vale (goodbye), and the name for carnival time in Greece is Apokreas, derived from how an ancient (partying?) 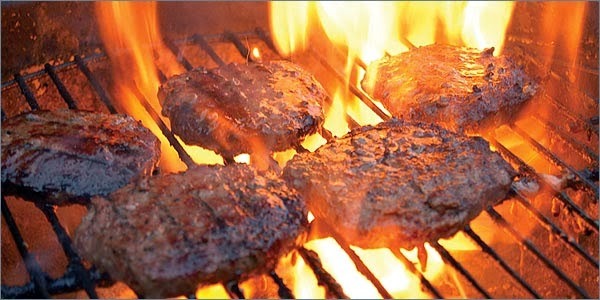 Greek would literally say goodbye to meat (kreas). And let’s not forget that those ancient Greeks knew how to party. 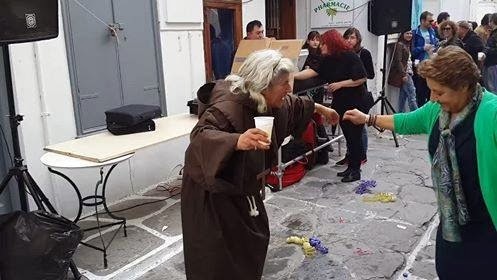 The dancing, drinking, and feasting associated with Greece’s carnival today—not to mention all that masquerade dress-up—is a direct descendant of those reveling worshipers of Dionysis, the Greek God of Wine and Feast. 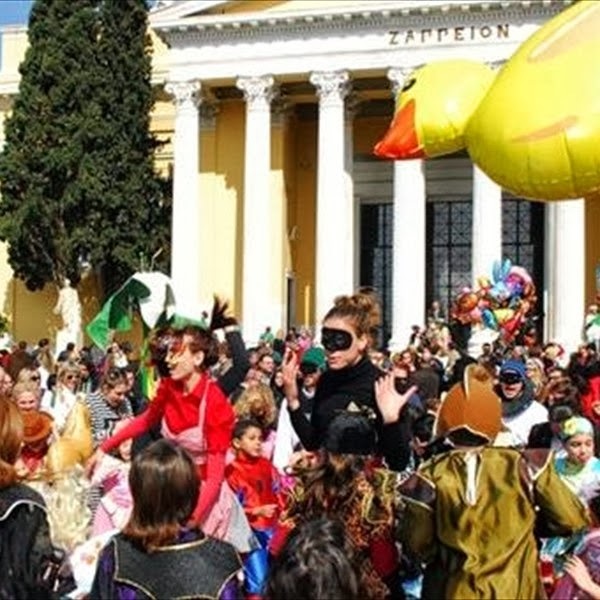 Bet you never thought to add Greece’s Patras to the list of Mardi Gras hotspot cities like Rio de Janeiro and New Orleans? Unless, of course, you’re Greek and know the partying runs right up until Lent. Back to Tsiknopempti. Though it may be the time for saying goodbye to meat, dairy lovers get a break for another week—called white or cheese week. But come that second Monday after Tsiknopempti (called Clean Monday (aka Kathara Deftera)), the consumption of all red-blooded animals and of anything derived from those critters is forbidden. 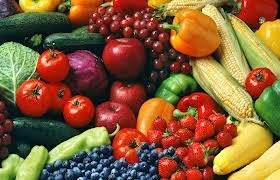 No meat, fish, milk, cheese, yogurt, eggs, etcetera. Contrary to what you might think, Greeks see Clean Monday as a day for rejoicing—and I’m not talking about just the vegetarians among them. It’s a national holiday widely held to signal the start of Spring, a day for kite flying, trips to the seaside or mountains, and a picnic feast on foods still allowed. 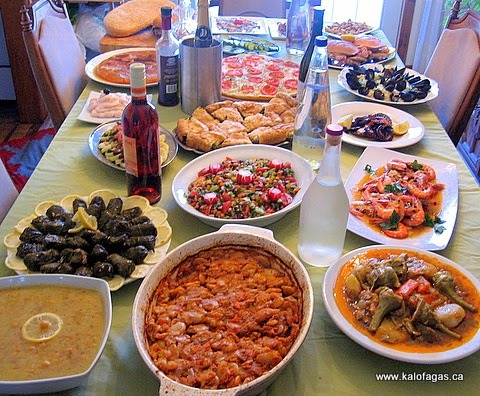 And there are many: Lagana, an unleavened flat bread traditionally served and eaten only on Clean Monday; taramosalata, a tasty dip made of cod or carp roe; fava (split pea) puree; yigandes, giant kastoria beans in a casserole with tomatoes, onions, herbs, and spices; salads of marouli (romaine lettuce), three beans (fassolia), and perhaps revitho (chickpea) salad with artichokes and sun-dried tomato; dolmades, the traditional grape leaves stuffed with rice and fresh herbs; peppers stuffed with bulgar and herbs; calamari—no, not the award Cara, Lisa, and I are nominated for at Left Coast Crime—squid prepared fried or in any number of other ways; octopus grilled as is, or dressed up with tomatoes, capers, and other special touches; cuttlefish in wine sauce with pearl onions; garides, giant shrimp grilled with lemon; stews of wild mushrooms, onions, and herbs; halvas (semolina pudding); loukoumathes (puffs of fried dough in sweet syrup sprinkled with cinnamon and walnuts); pasteli (sesame-honey candies) … and on and on. And let’s not forget the ouzo, tsipouro, wine, and beer. I hope I’ve given you a glimpse into the Greek soul, but if not, perhaps at least some sense of where all those endless Greek diner menus come from. Would you fly in a plane that has no pilot? Has Anyone Heard From Lisa? Moira Anderson; Too little, too late. It's Taxing to be a Greek These Days.